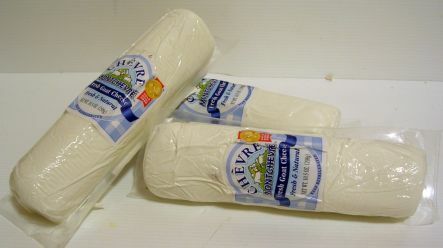 The pungent, goat-y chevre you get in the grocery store is an acquired taste. I’ve definitely acquired it. But many people haven’t. Part of the reason it’s so pungent is that it’s old. The longer goat cheese sits, the more pronounced its flavor becomes. This flavor is caused by an enzyme called “lipase” that exists in ALL milk, regardless of the animal it comes from, but is present in much higher quantities in goat’s milk and sheep’s milk than it is in cow’s milk. Thus, the cheeses made from goat and sheep milk tend to be correspondingly more sharp and pungent than cow’s milk cheeses. You can actually make ANY cheese from ANY milk. (Including human milk!) Goat cheddar is divine, and takes fewer months to reach the sharpness that takes a year or longer with cow’s milk. But making hard cheeses for ageing is much more complex and requires more specialized equipment. To make divine fresh chevre, all you need is a thermometer, some cheesecloth, a pot, and some goat milk. Oh, and a bacterial culture called “mesophilic cheese culture” which you can get easily on Amazon, plus rennet which you can also get on Amazon, or get both from most local home-brew shops. The following recipe is for 1 gallon of milk. You can scale up or down depending on how much milk you have. Over medium heat, bring the temperature to 75F. You should stir the milk often in a circular motion from the bottom up to evenly distribute the heat. If your pot is very thin and light, you will want to stir more frequently, scraping the bottom of the pot with a spatula, so you don’t scorch your milk. But since you’re only heating to 75F, that’s not a real danger as long as you keep the heat moderate. The separation of curds and whey…a part of the cheesemaking process for every cheese from Asiago to Zamorano. Let the culture sit on the surface of the milk for 5 minutes. The GENTLY stir using the same slow bottom-to-top motion for 2 minutes using a VERY CLEAN spoon. You don’t want to introduce bad bacteria to your warm milk, only the correct bacteria! Use the instructions on your rennet to prepare enough rennet for 1 gallon of milk. Generally, 2 drops of animal rennet dissolved in 1/4 cup of cool water is sufficient for 1 gallon of milk for chevre, but some rennets are stronger or weaker. Add the diluted rennet to the milk and stir again, VERY gently, up and down, for 2 minutes. Then cover the pot and forget about it for 12-16 hours at room temperature, or as close to 72 degrees as you can get. If your room is warmer, the cheese will curdle and culture more quickly, and you’ll have a stronger flavor. Fresh chevre, hanging to drain. Get your draining station ready before proceeding to the next step. You’re going to need clean surfaces, cheesecloth or butter muslin, scissors to cut it with, and a place to hang the cheese to drain. 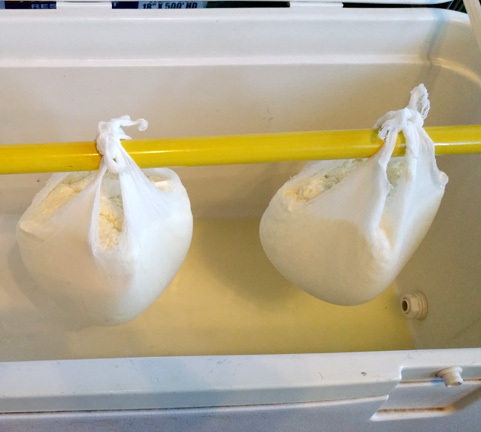 When I’m making a lot of cheese, I use my big cooler, and a long broom handle to hang the cheesecloth from. If I’m just making a single 1-gallon recipe, I can hang the cheesecloth on my kitchen faucet and let it drain into the sink overnight. Prepare your squares of cheesecloth or butter muslin. Butter muslin will only need 1 layer, but cheesecloth will need at least 3 layers. The size of your squares will depend on how much cheese you’re making. For a 1 gallon recipe, an 18″ square should be sufficient. For larger recipes, use larger squares, or multiple smaller squares. Dampen the cheesecloth, wring it out, and spread it out into a colander. Then set the colander into a larger bowl to catch the whey. Remove the lid from the cheese. 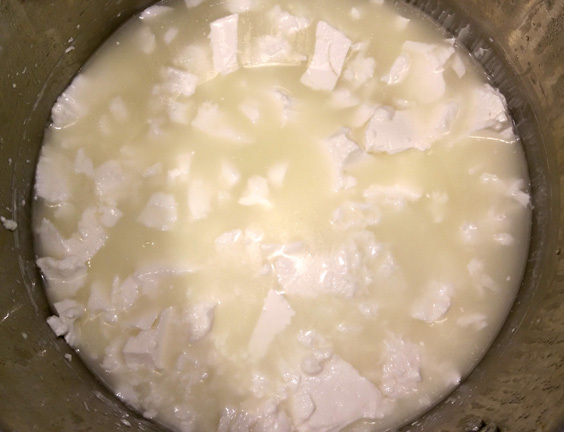 You’ll see that the milk has now separated into a solid white mass (the “curd”) and a greenish liquid (the “whey.”) Using a CLEAN slotted spoon (or better yet, a kitchen spider), GENTLY scoop the solid white curd out of the pot and set the curd into the cheesecloth-lined colander. As you scoop, the curd in the pot will start to break up, so be as gentle as you can. As you get most of the curd out of the whey, you can switch to a strainer to get as much curd as possible. Pour the final whey through the strainer to get all the last few bits. While you can discard the whey, that’s a huge waste. (Especially with expensive goat milk!) That whey is delicious and full of protein and probiotic cultures. At the VERY least, feed it to your plants or pets. But it makes a fabulous base for smoothies, or substitute it for water in any bread recipe for an outstanding loaf! 12 hours is the sweet spot for a creamy, rich chevre that’s milder than commercial chevre, but with a pleasant bite to it. Don’t bother collecting the whey that has drained and been sitting for hours, it’s too fermented for most people to enjoy. But your dog or cat might love it!